Letter from Vanessa Robertson to Caroline Pearce-Higgins regarding a commission for the Crafts Advisory Committee collection. 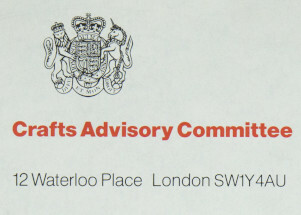 The letter includes the authors suggestions for three different rugs, dated 8 December 1976. Handwritten in black ink on personalised letterhead paper.